Voting patterns are geographical patterns – as shown is this example from the Galway East constituency. There is a lot of debate at present as to whether Fianna Fail are running too many candidates or not, relative to their current low levels of support in the opinion polls, and indeed, as akin to a burnt earth strategy, the parties is effectively surrendering some of the seats it won in 2007 by running fewer candidates in some constituencies than the number of seats the party won in that election (e.g. Donegal North East, Dublin South, Limerick). However, part of the reason as to why Fianna Fail has tended to win roughly 40-45 per cent of the vote in Irish general elections prior to this contest can be related to the fact that the party has tended to run significantly more candidates than any of the other parties and the fact that each extra candidate brings with them a certain personal/local vote to add to the party votes they can hope to win. 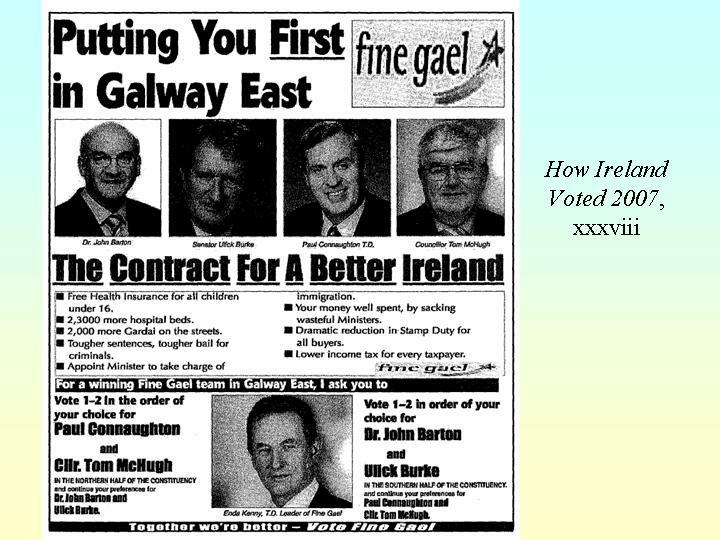 Parties of course also react to this and will encourage their supporters to “vote locally” in order to balance the vote between party candidates as a means of maximising their number of seats in that constituency, as evidenced explicitly in a Fine Gael newspaper advertisement from that election (drawn from How Ireland Voted 2007). A similar post on the Donegal South West constituency may be viewed on the Political Reform website. This entry was posted in Candidates, Election data, Electoral Geography (voting maps) and tagged Fianna Fail, general election candidates, maps. Bookmark the permalink. Tallies for some constituencies will be readily available, as they are usually included in editions of local newspapers in the week(s) following the election – especially for constituencies in the west and north-west regions. From what I gather, geographical trends in these maps are the same as for all other previous elections – candidates will always poll strongly in their home areas and their vote will drop off dramatically the further they move from this base. 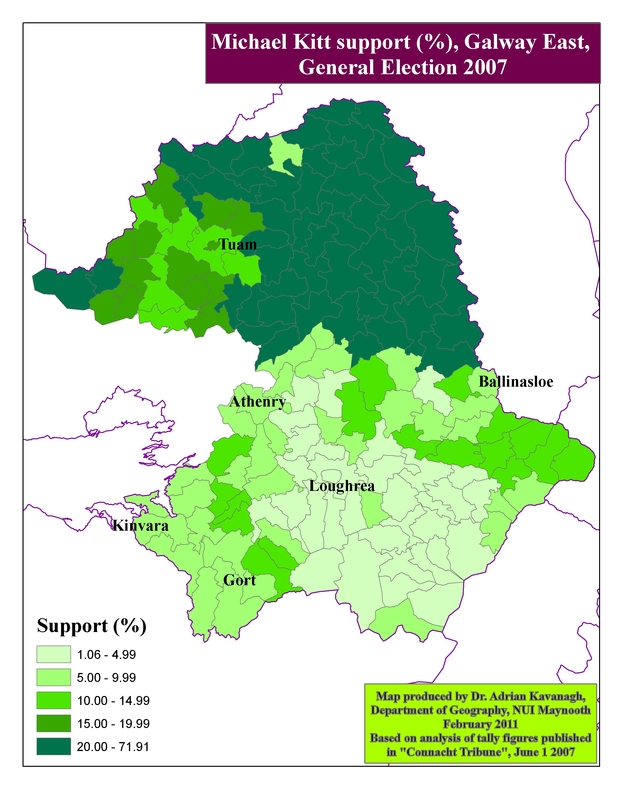 hi, is there a voting trend map available for Sligo N. Leitrim consituency? Hard one to call.